Clinically a premature baby, Ophthamological evaluation revealed abnormally small Optic disc on right side. Advised MRI for further evaluation. 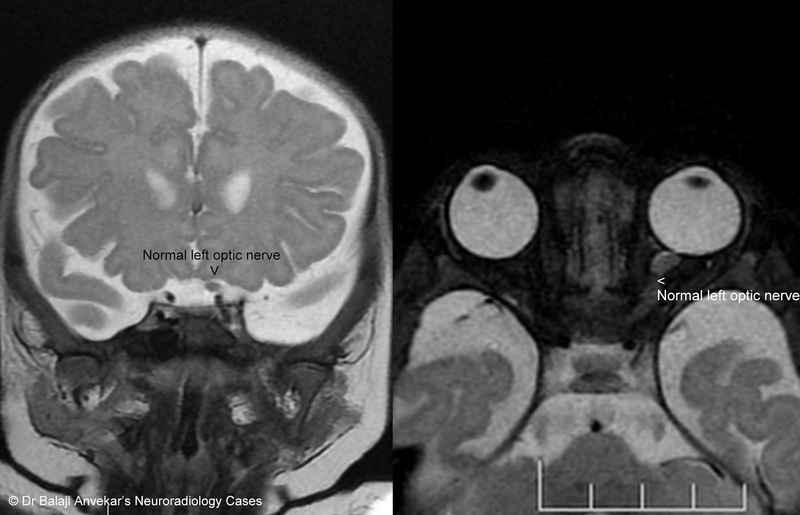 MRI brain shows absent right side optic nerve, its intra cranial as well as intra orbital portion. Left side optic nerve normal in caliber and signals, left half of optic chiasm and bilateral optic tracts normal. No associated anomalies of corpus callosum or septum pellucidum. Pituitary gland normal, no posterior lobe ectopia. Impression: Congenital Unilateral Optic Nerve Aplasia. A rare developmental anomaly characterized by the congenital absence of the optic nerve, central retinal vessels and retinal ganglion cells. 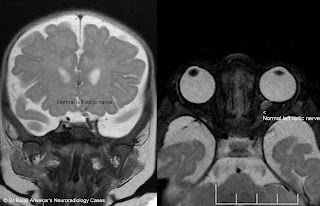 Aplasia is often unilateral, generally associated with otherwise normal brain development while bilateral optic nerve aplasia is usually accompanied by severe and widespread CNS malformations. The pathogenesis of optic nerve aplasia may be due to defective formation of the embryonal fissure, failure of the mesenchymal anlage of the hyaloid system to enter the embryonal fissure, or primary agenesis of the retinal ganglion cells. Optic nerve hypoplasia is seen ophthalmoscopically as an abnormally small optic nerve head. A peripapillary ring around a small optic disc is the hallmark, but is not always present. ONH may be associated with tortuosity of the retinal vasculature. A relative afferent pupil defect adds weight to the diagnosis. ONH is commonly asymptomatic and may first be detected by identification of visual field loss or observation of the optic nerve head. 3. Posterior pituitary ectopia (commonly associated with endocrine dysfunction). 4. Migrational anomalies in the cerebral hemispheres (for example, thinning of the corpus callosum, which is predictive of neurodevelopmental problems). Other associated brain abnormalities include porencephaly, schizencephaly, intracranial arachnoid cyst, and intracranial epidermoid cyst. Septo-optic dysplasia comprise any combination of ONH, pituitary gland hypoplasia, and midline abnormalities of the brain. Recent studies have shown that in SOD, key mutations have been identified in Hesx-1, a protein that is involved in the mediation of normal development of the forebrain and the eyes during embryogenesis.